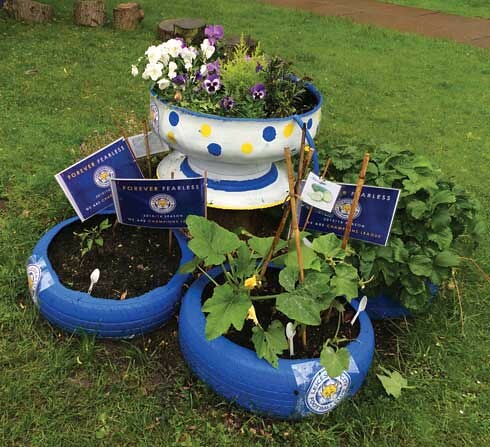 The garden in the shape of a cake was made by pupils and staff at Mayflower Primary School and it celebrates the Queen’s 90th Birthday this year, 2016. 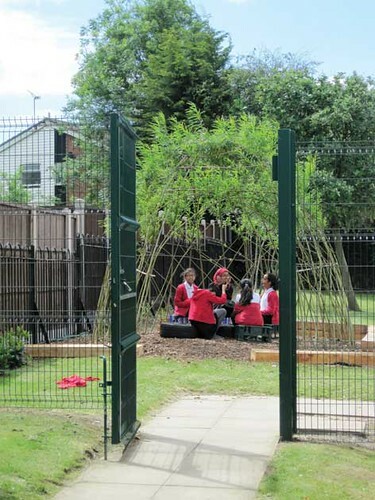 In January 2016, Mayflower Primary School gained the Eco Schools Green Flag award. For this award the school’s eco committee took responsibility for designing an action plan to keep the environmental work reviewed. With support from the Gardening club they also did lots of work on the school’s gardens. The Eco School topics are: Energy, Water, Biodiversity, School grounds, Healthy Living, Transport, Litter, Waste and Global citizenship. At the end of June, Mayflower heard that they had won the Leicester City’s ‘Grow Your Own Grub’ competition for the second year running. For this competition they had to design a delicious menu and grow as many of the ingredients as they could. 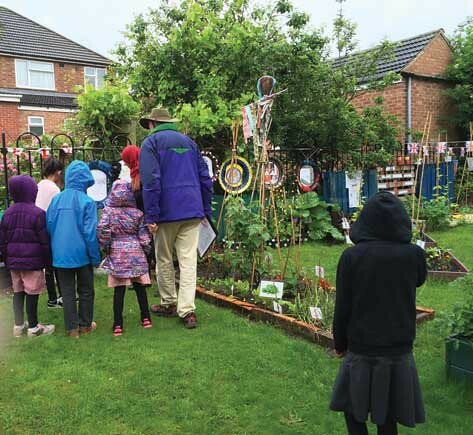 Mayflower Primary School were chosen by Evington in Bloom to enter the East Midlands in Bloom’s ‘Best School Garden’ competition. Mayflower are now part of the team that enters Evington in the East Midlands in Bloom and Britain in Bloom competitions. This garden celebrates Leicester City Football club’s success at coming top of the Premiership against all expectations. Summer 2016. Mayflower was chosen by Evington in Bloom to represent them in the East Midlands in Bloom’s Best School Garden competition 2016. Pupils at Mayflower Primary School enjoy time together in the Willow arbour that has been put up this year, 2016.